Congrats to Madeline Mora-Summonte who won Kristina McMorris’s Letters from Home. Visit Kristina’s website HERE. Deb Kim is on CafeMom all week in their “Ask the Expert” forum. You can ask any questions at all about autism. You don’t have to be a parent to pop in and ask. Click HERE to go into the forum, “How to Keep Laughing.” And please share with your friends who may have a child on the spectrum. The questions are starting and I’m blown away by the raw honesty. Deb Tawna’s dog, Bindi, is infinitely cuter and more talented than she is. You can read all about Bindi (including her role in Tawna’s writing life) at the Coffee with a Canine blog this week. Deb Elise has another Barbie movie on the shelves! Barbie: A Fairy Secret came out last week, and got a thumbs-up from Elise’s six-year-old daughter… which isn’t the slam-dunk one might imagine. Deb guest Meg Waite Clayton‘s new novel, The Four Ms. Bradwells, will be out this Tuesday, March 22! The paperback release of Deb guest Leah Stewart‘s Husband and Wife has been chosen for the Target Emerging Authors program! My school didn’t have a prom! I did, however, go to my friend’s senior prom, which should have been wonderful, but I was too socially inept to handle it. Despite the fact that David (so not his real name) and I were terrific friends and always had a great time together, I was acutely aware that he was interested in being more than friends, and that I had an on-again/off-again boyfriend at my own school, and I wanted no one around to have any confusion about where my romantic interests really stood. So instead of enjoying a full night-into-morning (he had the limo all night, and I was told after-parties were A-OK with my folks — David was a nice boy and an old family friend) of platonic awesomeness with a fantastic guy… I pretended to fall asleep in the limo right after the dinner-dance so he’d take me home immediately. 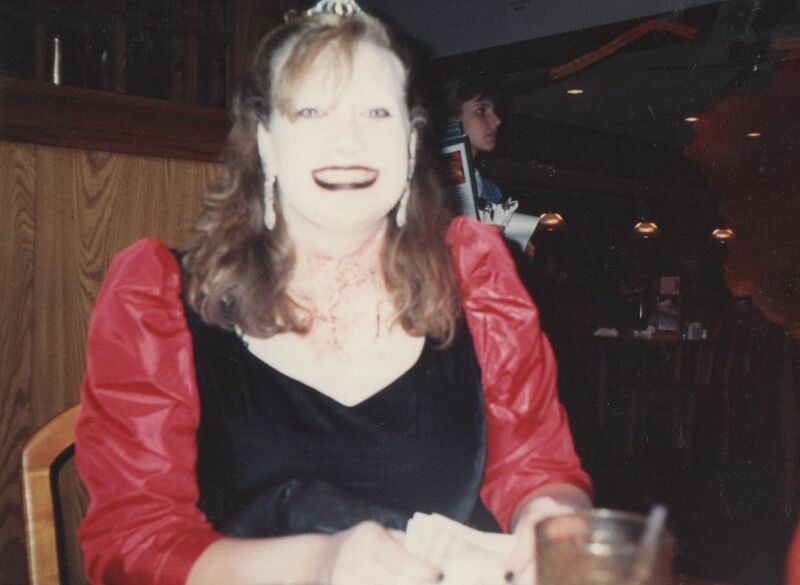 Let’s just say re-using my prom dress for this Halloween costume (zombie prom queen before zombies were cool) was the best thing to come out of my prom experience. I’m the prude who went to a private high school that had “banquets” not dances. Sadly, no prom memories, but plenty of cheesy dress photos, just the same. Though I dated the same boy for much of high school, my best prom was the one I went to with a huge group of friends and made as unromantic as possible. We rented a giant van and hired our favorite teacher to drive us around. We put together this crazy scavenger hunt at Toys-R-Us and spent an hour there running around in our formal attire giggling our fool heads off. We capped off the evening watching Star Wars at my house. I don’t actually remember if we made it to the dance, but that part was pretty much irrelevant. We had a blast. I think it’s interesting that 3 of the 5 of us went to schools that had no prom (myself included). And having realized that apparently most people’s proms don’t turn out like a teen movie, I’m going to stop feeling bad about having mine not be that way either! Sadly, I had strep throat and couldn’t go to my senior prom. Considering some of the prom stories I heard from my friends afterward, it’s probably just as well. I can think of more fun things to do than strep throat, but I’m glad to hear it wasn’t a disappointment! I agree with Eleanor, it is interesting that 3 of the 5 had no school prom. Was it a private school thing? I’m really curious! Though my school had prom, the actual dance was something a lot of people just skipped. For most of us it was all about primping with your friends and getting dressed up and going out to dinner. I don’t remember spending more than 10 minutes at the dance with any of the proms or winter formals I attended. Mine was a private school. There was a spring formal, but it wasn’t very formal. Maybe it’s partly culture – a lot of the people I went to school with were going to cotillions and debutante balls, so it’s not like dressing up for prom would have been different or momentous. I’m so interested that the dance itself wasn’t that big a deal – I know some kids don’t like to go because they can’t drink, but that’s clearly not what you’re getting at. Interesting. I smell an anthology.